I cannot tell a lie. Before visiting Kangaroo Island in South Australia, I had visions of a tiny island being jam packed with Kangaroos. I assumed it was a wildlife preserve and kangaroos would be everywhere. As it turns out, Kangaroo Island is Australia's third largest island filled with wildlife, adventure, luxury accommodation and beautiful scenery. Our trip to KI started with a flight on the Regional Express from Adelaide. We left the majority of our gear at our hotel, The Rockford Adelaide as the Regional Express airways has very strict baggage allowances. (10 Kilos) We scaled it down more than enough and arrived at the island first thing in the morning to start our three day safari with Kangaroo Island Wilderness tours. It ended up being a fantastic itinerary. Because we were on a private tour, we could make our own schedule and had a lot of flexibility to see everything that we wanted. So here's what we saw! 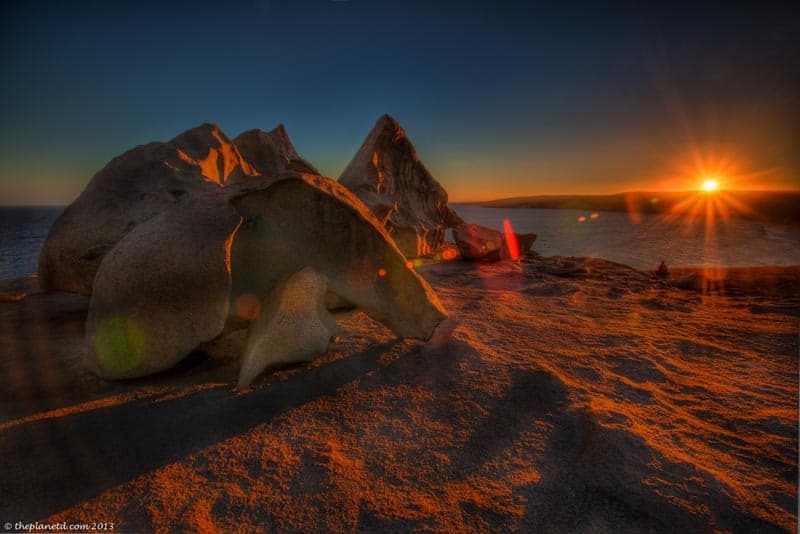 The main attraction that Dave wanted to photograph was the famous Remarkable Rocks in Flinders Chase National Park. We expected them to be bigger and a little more remarkable, but they were beautiful none the less. The Remarkables are rocks turned into giant works of art. These granite boulders have been sculpted over 500 million years creating unique formations balancing precariously on the edge of the sea. It's worth it to wait for the sun to set as the boulders light up to beautiful shades of orange and red creating deep shadows, perfect for photography. There's not many people around at this time of day, so you have the rocks almost all to yourself! 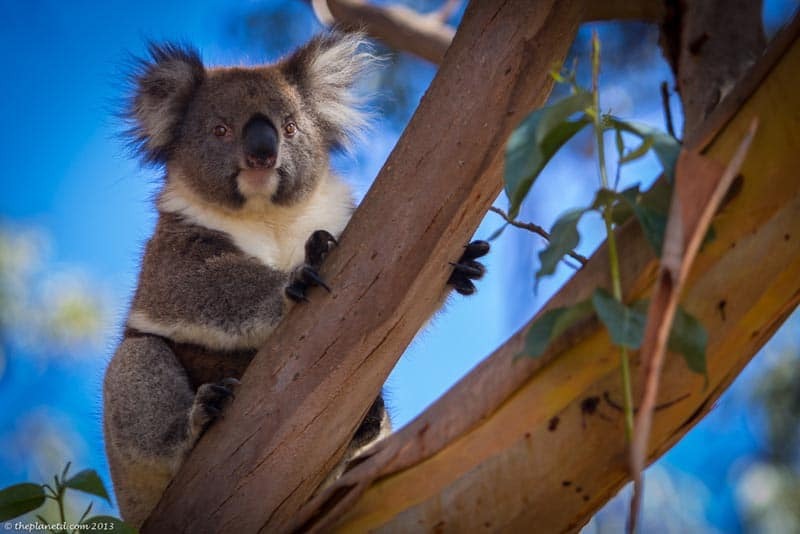 We had only seen a few Koalas during our time in South Australia, so we were looking forward to getting a closer view of them on Kangaroo Island. Hanson Bay Wildlife Sanctuary is the perfect spot to find Koalas. When someone spots one, they put up a flag below the tree to make it easier for you to find them. When we arrived they had spotted 5 that day. Koalas can be a little tricky to spot, but once you find one, you know where to look and it gets easier. I think that they may be the laziest animals on the planet though. All they ever seem to do is sleep, but if you do manage to get one to raise their head between sleeping or eating, they are just as cute as a button. 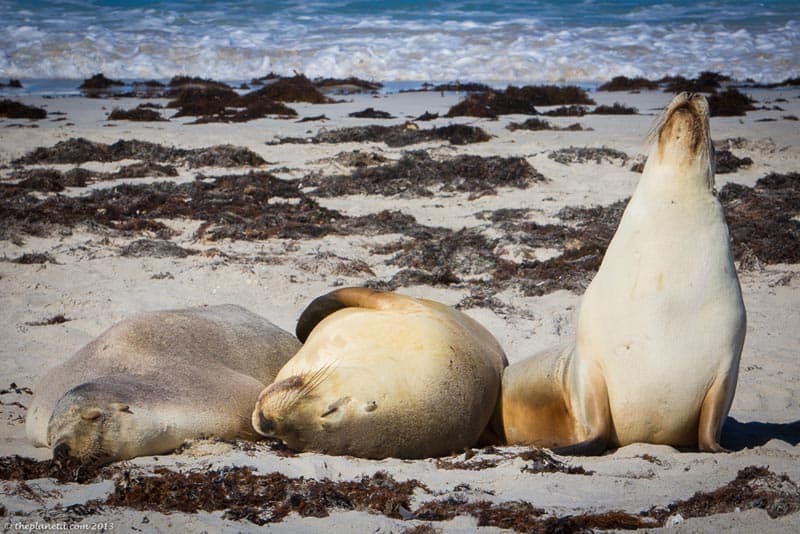 If you want to see seals when traveling, Kangaroo Island is the place to do it. There are a couple of different viewing opportunities from the rocks and arches at the lighthouse to Seal Bay where you can see tons of seals basking in the sun or surfing in the waves. Seals go out to sea for days hunting and diving as deep as 100 metres to search for food. It's exhausting work and when seals are on shore, they don't do a heck of a lot besides sleep. However you'll see a lot of cubs playing in the waves and it is the cutest thing to watch. Surprisingly we didn't see any kangaroos until the second day of our tour when our guide Terry took us for a stroll through a conservation area. Not many tourists go to this area and it pays to have a guide with you because we never would have found this on our own. It was amazing once we walked through the path to a clearing in the woods. There were kangaroos everywhere and not only were they plentiful, they put on a great show for us. Terry told us that this was a rare site to see them standing up high on their hind legs to eat leaves in the trees. I don't know if it is rare or not, but it was beautiful to watch. They didn't seem to mind that we were there one bit. They'd glance in our direction every once in a while, but for the most part they went on with their day. Terry asked us if we were interested in seeing some pelicans being fed and being game for anything, we said sure. We didn't know what to expect at Kingscote Warf when we saw the Pelican man, but what we ended up seeing was entertaining and impressive. For a donation of $5 per person you sit on the steps to watch the Pelican Man feed this feathered friends. It's stinky and dirty but it's a lot of fun to watch the pelicans get excited over a bucket full of fish. They know this routine well and even before he arrives, the birds are all lined up waiting to be fed. Once the fish comes out, it's a frenzy of wings flapping and mouths chomping. When you book a safari with Kangaroo Island Wilderness Tours, you don't have to worry about a thing. Everything is included. You have transportation, park and attraction fees, accommodation and meals. was the most amazing surprise when Terry dropped us off at the beach while he went ahead to prepare our meal. He gave us directions on where to meet him across the road and once we finished up in the surf, we wove our way through a path inside the gigantic web of roots and vines of the bough of a fig tree. 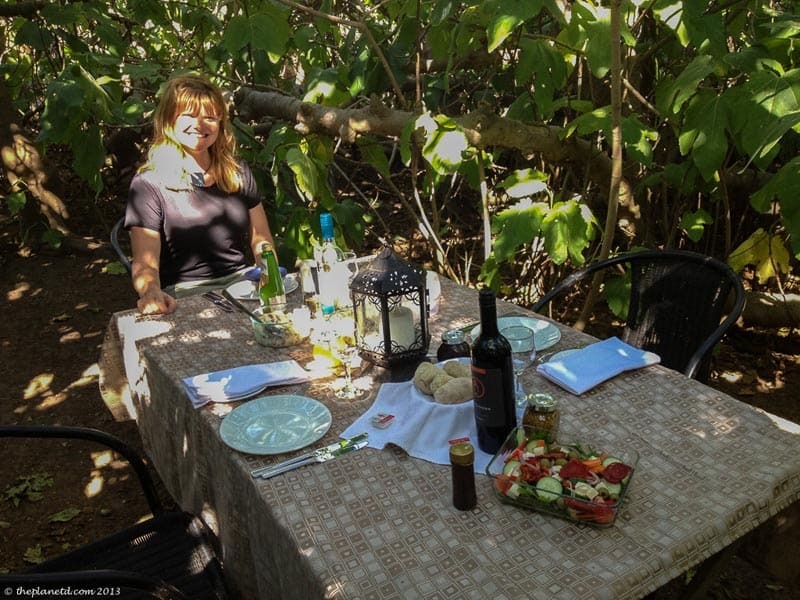 We didn't think we were going the right way until we came upon a clearing with a table set for a romantic meal in the middle of the woods! 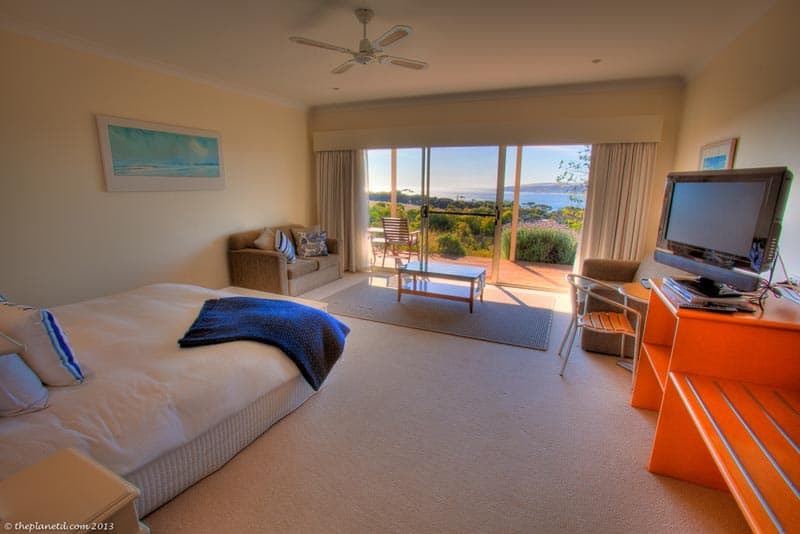 Each evening Terry dropped us off at the beautiful Seascape Lodge overlooking Emu Bay. This modern luxury inn run by Mandy and Paul, a couple who left the farming business six years ago to run this amazing getaway. The three bedroom lodge has a contemporary design made for luxury living. Before dinner, guests relax in the living room by the fire sipping wine while Mandy prepares a delectable home cooked meal. Her home cooked meals aren't the type your mom makes though, these meals are fine dining goodness in a relaxed atmosphere. With all inclusive KI wines and cocktails, dinner conversations with the other guests can be very entertaining. I could see hanging out in this place for days. The cozy rooms and large deck make for the most relaxing of atmospheres. Dave and I came home early one day to an empty house and found ourselves simply sitting on the deck looking out over the bay at the beautiful scenery below. Kangaroo Island may have a lot to do, but sometimes it's nice to just be able to sit and relax and take in the moment. The lodge has wifi included, but we couldn't bring ourselves to work when we were staying in such a beautiful setting. We truly had an incredible time on KI. Besides all the wildlife and scenery, I think it was our guide Terry who made it perfect. He was friendly, informative and fun and this well traveled guy had a lot of stories to tell. He was flexible and knew what to do to make the best of our trip. Kangaroo Island is difficult to get to and it's expensive to travel. The price of taking a car over on the ferry is high and each attraction and park has their own entrance fee. I think that the easiest way to see this island is to book a private guide to take you around. We stayed free of the crowds and found little hideaways that only a local could know about. If we had driven ourselves around the island, I know that we would have missed half of the things that made our trip so special. When you ask the locals what they think of how difficult it is to get to Kangaroo Island, they say they like it. If the government made it too easy, it would lose all the things that make it so special. It's the fact that you can be on the most beautiful beach in all of Australia (Vivonne Beach was once voted the best beach in Australia) and not see a soul. It's the fact that you can spot most the wildlife that makes Australia so unique free from crowds and you can spend your nights in pure luxury in total seclusion. 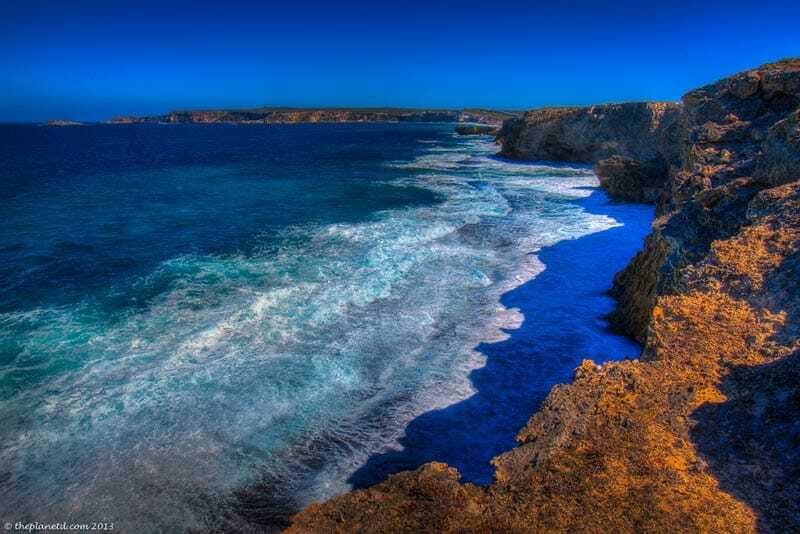 Kangaroo Island is the perfect getaway from the mainland. It's no wonder that it's the next location for Australia's best job in the world contest. Who wouldn't want to spend a year in paradise? 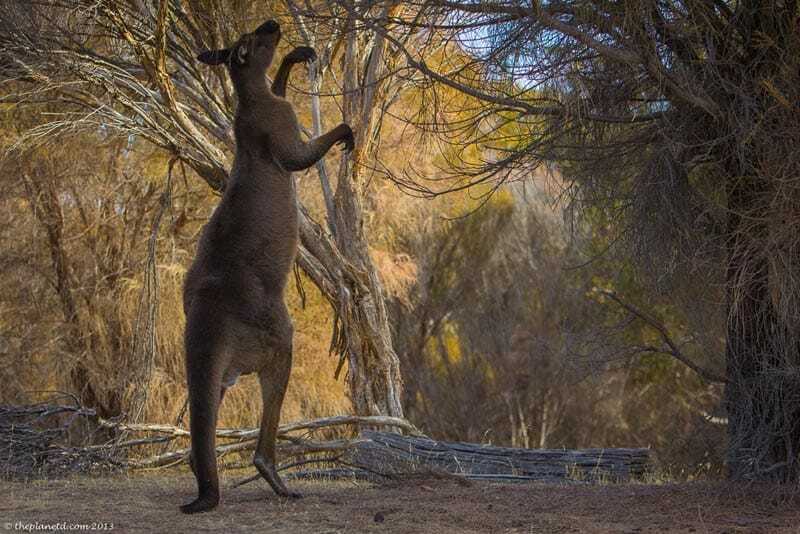 You can book tours to Kangaroo Island through Kangaroo Island Wilderness Tours accommodations are included with packages. 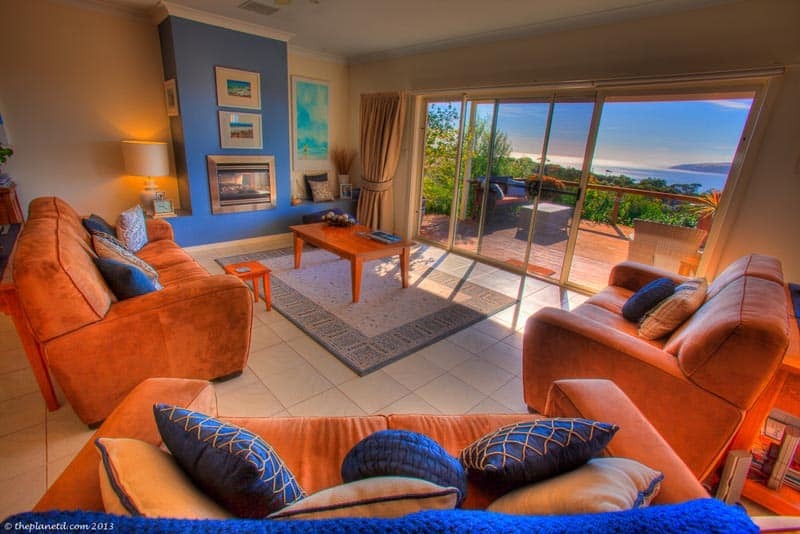 But if you happen to be on a self drive tour of KI, check out Seascape Lodge for your accommodation. What we love about both businesses is how down to earth and friendly they are. When visiting South Australia, everyone we met became fast friends. 35 Responses to "Best of Kangaroo Island, South Australia"
Australia is such a great country but I haven’t been to Kangaroo Island. It looks gorgeous, and I hope to make it there next time! Great photos! I unfortunately missed out on Kangaroo Island. Jade made it over, I may need to twist her arm into going back although I don’t think it’ll take much. Haha, yes, I think that it is an easy place to return to. Loved it there. Oh my gosh, what a beautiful island! I would love to see koalas and kangaroos in the wild. Looks like it was an amazing trip! Amazing photographs….I visited Darwin last month….must admit had a blast in the city….I went with my family and friends….the trip was awesome,we explore the various places in the town.By reading your post, I am tempted to go these areas. I hope you make it there, It’s really amazing and hardly anyone else on the island (except for the bus tours) but if you stay on the island and make it more than just a day tour, you’ll have it all to yourselves. Such amazing shots! We have not yet been to Kangaroo Island but had a wonderful time in Adelaide and Barossa when we went…next time! Fantastic that you’ve been to the Barossa Valley, it’s really beautiful there too. Australia is so big, it will take many trips to see it all. Amazing photography. HDR photos are so surreal and beautiful!! I wish to travel there one day and thanks for the infos. Everything seems so perfect. 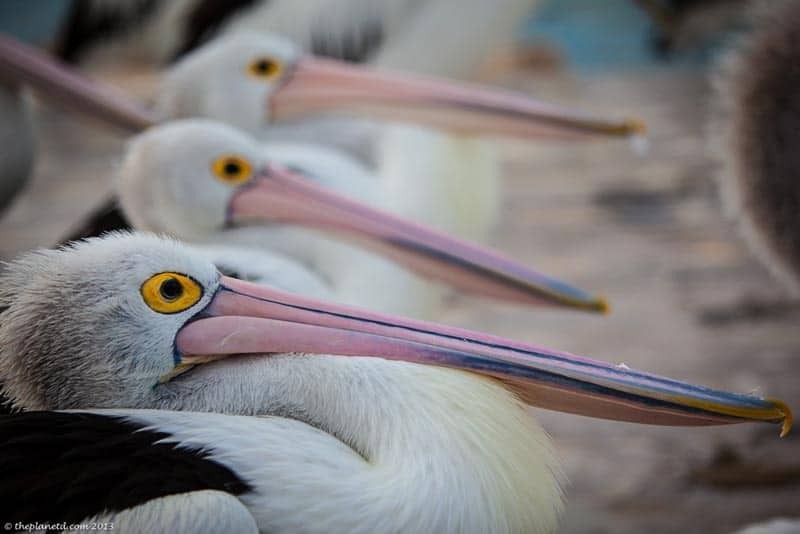 Love the pelicans, especially their eyes. And the lunch setting is so interesting, so is the accommodation. The view is great from the room. Beautiful photos as always! Thanks Salika, looking back I have to admit that everything sort of was perfect. I didn’t really think about it at the time, but our three days on Kangaroo Island were awesome. Every detail was thought of. I love your presentation. Every click is amazing. I would love to visit this place. Thanks for writing about such a plenty of beauty. Thank you! South Australia is a pretty amazing destination. We spent some time in South Australia last year and didn’t have the chance to get over to kangaroo island. Jeepers how disappointed am I after seeing this post. 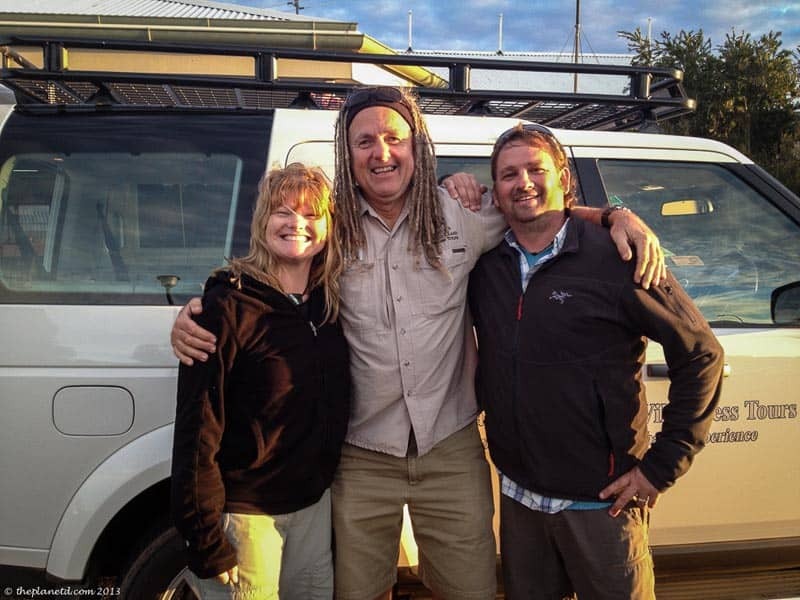 Awesome photography as usual Dave, and what impressive dreadlocks! AW, there’s always next time. Where did you go in South Australia? We had such a great time in so many parts of it, that I’m sure you had a blast no matter what you did. I know, aren’t they cute? we’re putting together video of the trip as well and can’t wait to show off the frenzy that we caught in motion. They’re adorable. And Oh yes, always a bottle of wine during our travels. South Australia has amazing wine, from the Barossa Valley to vineyards on Kangaroo island, we were always drinking local fare. Wow, you got some great photos! When I was there, The Remarkables were thronged with tourists. It took me 30 minutes to get a shot without anybody in it, and that was pure luck and just good timing. I hear you, we changed our original itinerary to go at sunset. We kept one step ahead of the tour buses. The tour buses come in for day trips and then leave in the afternoon. If you can get out to these popular spots in the morning or late afternoon, it’s much better. We then went to all the other parts of the island during the day and never saw a soul. Beautiful photos as always. I am not a huge fan of tours but this place seems quite nice. I love the look of the lodge. Typically, I don’t do much luxury but when it’s a bit of a private escape with scenery and views like this, I love this stuff. So many great photos of wildlife and the rocks. Seems like it’s a very isolated, quiet place there. This is something I would enjoy doing. yes, this is a great tour. What we like about it is that it’s a private tour so you have complete control. Terry asked us what we’d like to see, where we wanted to go and what time we wanted to be picked up and dropped off and we went from there. IF we didn’t like a place we could leave or if we wanted to stay longer, we could hang out. I’m all for these types of tours for places as spread out as Australia. It’s difficult to see everything on your own and know where to look and unless you rent a car and self drive, most of the destinations are impossible to get to. A private tour is the way to go and it’s probably the most reasonable because meals, guide, entrance fees and accommodation is included. I gotta agree with Andi – these pictures are unbelievably beautiful. 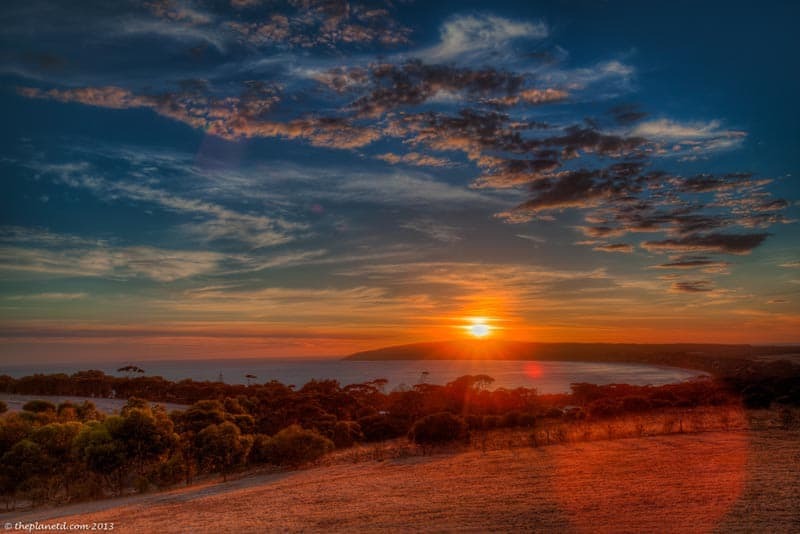 Kangaroo Island looks like the perfect destination for a worn-out traveler interested in a unique experiences and some r&r. Thanks for sharing! Well said Paul, that is exactly what its for.There’s not a lot of tourists around, it’s laid back and it’s beautiful. I’m so sad I missed this place when I was in Oz! Your pics are phenomenal. Love the guy in dreads!!! !